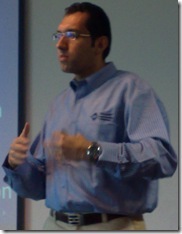 Today Microsoft Egypt hosted the first event introducing SharePoint Server 2010 by EGYSUG andSharePoint4Arabs.com . Despite the fact that it was early on Saturday morning, I was extremely happy to see that the attendance was quite reasonable and the facilities worked out really well. We are planning to deliver another session very soon in co-operation with DotNetWork User Group ,Clickhere to join EGYSUG and be the first to know about our plans, sessions and workshops. As a farm administrator, you will definitely need to restrict SharePoint Designer usage in many cases. For example , you might need to totally prevent users from connecting to SharePoint sites using SharePoint Designer 2010, you might also need to disallow pages unghosting and in many cases you will need to prevents end users from managing the web site URL structure. Fortunately, in SharePoint 2010, farm administrators can manage SharePoint Designer settings at the Web Application level from the central administration as shown beneath. This way, the farm administrator will restrict all site collection administrators and revoke some privileges from them. Also, there is a similar screen at the site collection level, from which site collection administrators can restrict other users. For example as a farm administrator, I have disabled Managing the URL structure at the web application level. Now, when site collection administrators check the SharePoint Designer settings at the site collection level, they will get the screen below. NOTE : This article was published on EndUserSharePoint.com a couple of weeks ago and because of the wonderful feedback I received, I decided to cross-post it here too. This is the fifth article in a multipart series that is intended to help you create mailing lists for your SharePoint sites or blogs without writing a single line of .NET Code. In the introductory article, I listed the project initiatives, requirements, and objectives. In Part 1, I created a secured backend where we will store the subscribers’ contacts. In Part 2, I configured the ‘Contact’ content type, created a subscription form for the mailing list and did some simple customizations to it. In Part 3, I utilized the thrilling DataFormWebPart to further extend and enhance the subscription form to meet the project requirements. In Part 4, I implemented requirement # 3 by creating a list that comprises the names of all the countries of the world and a lookup field that gets its values from this list. In the previous article, I encouraged you to read Paul Galvin’s post titled “Email and SharePoint Designer Workflow” if you are new to SharePoint Designer Workflows. The reason I recommended this is that I will get directly into creating and implementing the workflows needed for our mailing list. It’s a mailing list, why do we need to create workflows? To answer this question, I will share two questions that I recently received. Q1: When I connect the subscribers list to Outlook, I get all the contacts (the approved and non-approved) ones. In my case, I need to allow the newsletter administrator to send emails only to the approved contacts. 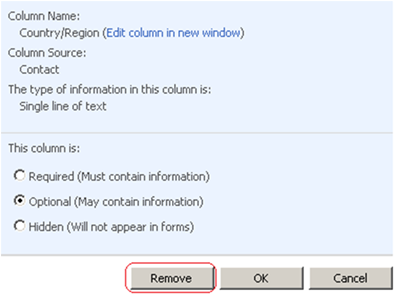 This column has no corresponding one in Outlook, so what could be the solution? 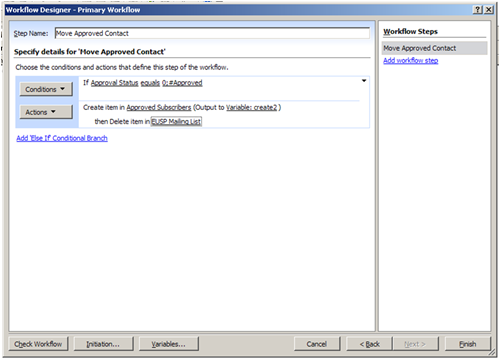 Q2: I have created a view that contains only the approved contacts, is it possible to only synchronize items in a specific view rather than all the list items? Good questions. I am happy that you’ve been paying attention. And that you concluded I would use the “Connect to outlook” feature to allow list administrators to send e-mails to the mailing list subscribers. 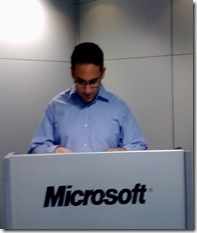 Unfortunately, when connecting a list to Outlook it occurs at the list level, not at the view level. 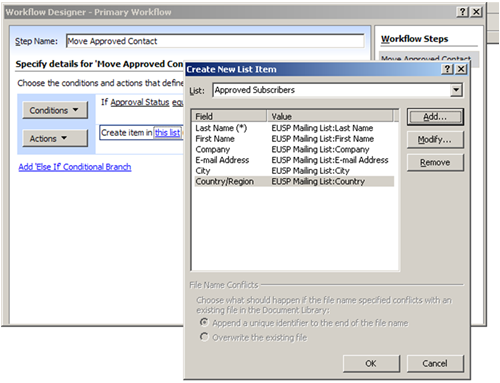 To work around the limitation, I will create a simple SharePoint Designer workflow that moves the approved contacts from the subscribers list to another new list so that this new list will only contain the “Approved Subscribers”. 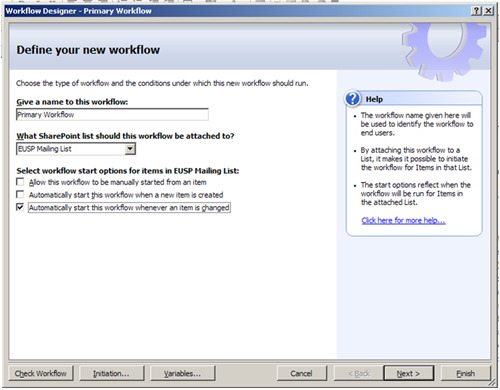 So this is the first workflow or to be more accurate let us call it the primary workflow. What about the secondary one? The secondary workflow is very simple; its only purpose is to send e-mails to the subscribers as soon as their request to join the list gets approved (Fifth Requirement). 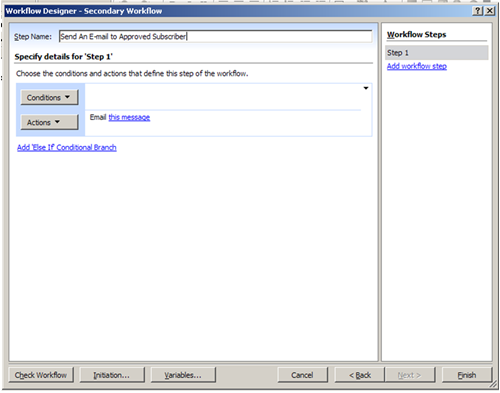 When the list administrator approves a subscription request, the primary workflow is triggered. 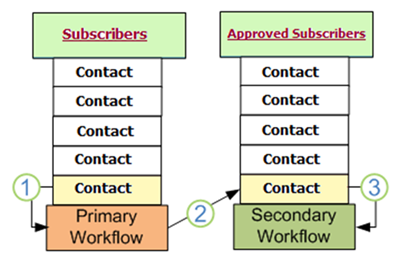 The primary workflow moves the approved contact to the “Approved Subscribers” list. The addition of an item in the “Approved Subscribers list” triggers the secondary workflow, which in turn sends an e-mail to the requestor. Note: You need to create another Contacts list and name it “Approved Subscribers”, refer to the first articleif you don’t know how to. Also, note that this list should only be available to the mailing list administrators and not to anonymous users like the first one. 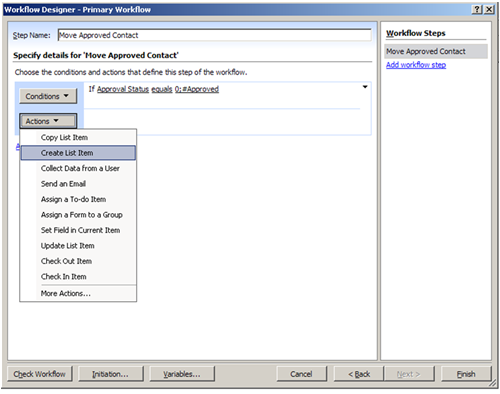 On the File menu, point to New, and then click Workflow and follow the figures bellow. Now you can connect the “Approved Subscribers” Contacts to outlook and gain all the functionalities provided by it! I agree, it was a long journey but it was an interesting one. Iin this article, I just scratched the surface. 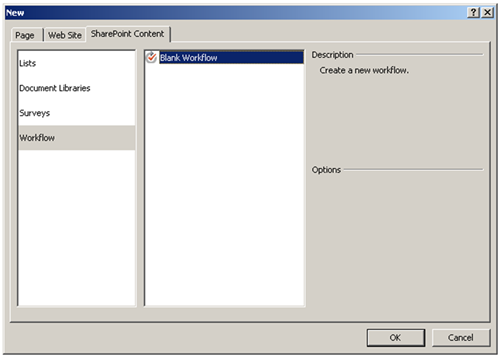 If you are interested in “SharePoint Designer Workflows”, Bjorn Furuknap has done a terrific job putting together a comprehensive issue from Understanding SharePoint Journal to discuss Business Process Automation using SharePoint Designer Workflows. In the next and the last article in this series, I will explain how to administer the mailing list and how to integrate it with Microsoft Word. Stay tuned for this article; it is the most interesting one in the series. So until I talk to you again, check out my blog at http://www.aymanelhattab.com , where you will find shorter articles, tips and tricks, questions and answers, and downloadable content. You can also follow me on Twitter http://www.twitter.com/aymanelhattab or drop me an e-mail atayman.elhattab@gmail.com if you have any questions. 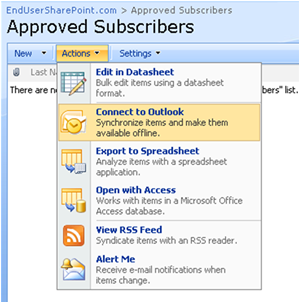 EndUserSharePoint.com is a community of SharePoint authors dedicated to providing content to SharePoint End Users on three levels: Information Worker, Power User/Site Administrator and Site Collection Administrator. Egypt SharePoint User Group is glad to invite you to its November 2009 gathering. For me, I’ll be speaking next meeting ( December 09 ), I’ll let you all know as soon as everything is settled. This is the fourth article in a multipart series that is intended to help you create mailing lists for your SharePoint sites or blogs without writing a single line of .NET Code. In the introductory article, I listed the project initiatives, requirements, and objectives. In Part 1, I created a secured backend where we will store the subscribers’ contacts. In Part 2, I configured the ‘Contact’ content type, created a subscription form for the mailing list and did some simple customizations to it. In Part 3, I utilized the thrilling DataFormWebPart to further extend and enhance the subscription form to meet the project requirements. 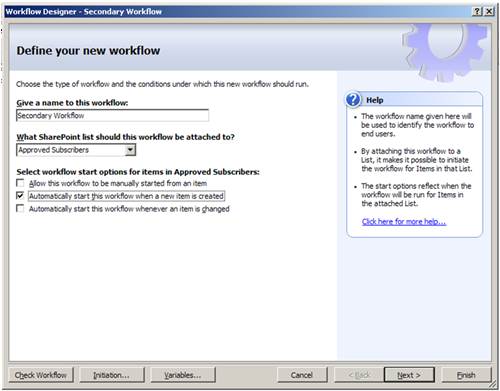 In the previous article, I promised to tackle a new area, which is “SharePoint Designer Workflows”. However, while writing the promised article, I received some e-mails, from followers of this series, asking about the country lookup feature I mentioned in the project requirements. I found a zillion of articles throughout the web covering the “lookup fields” and “lookup lists” topics into enough depth and listing their gotchas and limitations. However, I will provide you with some steps, tips, and free stuff that you will definitely need to implement this requirement. To make this article more useful, I will also explain some other topics during the implementation like List Templates and SharePoint field type conversions. 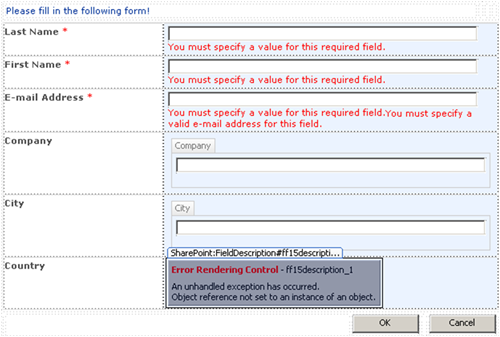 I’ll show you how to modify the FormField Controls and how to mark a list as invisible using SharePoint Designer. Note: Do not forget to allow anonymous access to this list as I showed you in the first article. 4. 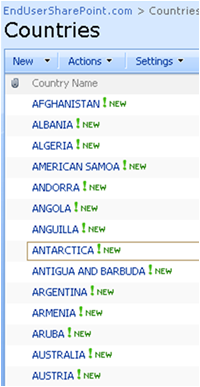 Now, you need to change the “Country/Region” field type to “Lookup (information already on this site)” rather than “Single line of text” to gets its values from the “Countries” list you just created. 5. Navigate to the Contact content type settings page from the list settings one. 6. Oops! 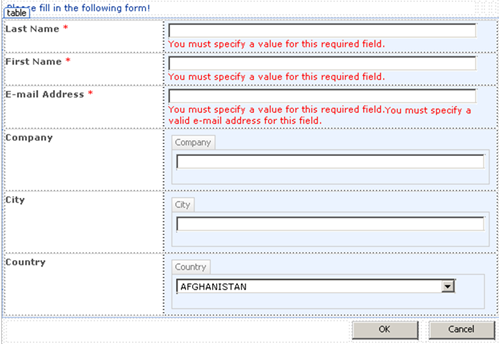 You cannot modify the “Country/Region” field to be a lookup one! 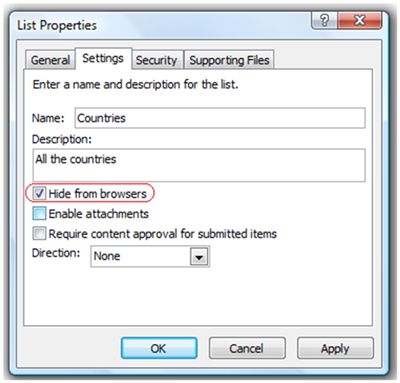 Yes, this is not supported by design, for a list of supported SharePoint field type conversions, refer to this article. 7 . 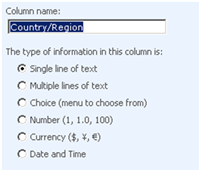 For the sake of simplicity, I will just delete the default “Country/Region” column and replace it with a new lookup one as shown below. 8. 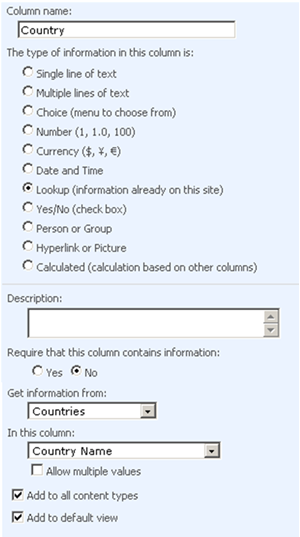 To mark the “Countries” lookup list as invisible (Only the list and not the included content, which should be available to all the site users including anonymous ones), open up SharePoint Designer, supply your credentials, and follow the steps illustrated by the following figures. 9. Open the custom subscription form. Unsurprisingly, you will get an error like the one shown below. 10. The reason I have received this error is that I’ve modified the list fields and some form fields are still looking at the deleted country field. To fix this error, modify the FieldName attribute values of the FormField and FieldDescription controls to be “Country” instead of “WorkCountry” or you can just useFind and Replace to achieve the same result. 12. Preview your form from the browser and there you go; now you have a list with a form analogous to the one I have shown you in the introductory article… Congratulations! 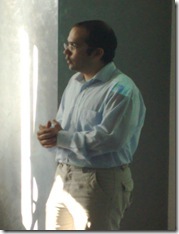 Since the kick-off of this series, I have received amazing feedback from EUSP visitors and my blog followers. I would like to extend a special thank-you to everyone who took time to drop me an e-mail, follow me on twitter, or even leave me a comment. Your feedback means a lot to me. I noticed that most of the questions that I have received lately focused on the sixth requirement. For easier reference, I have copied it below. 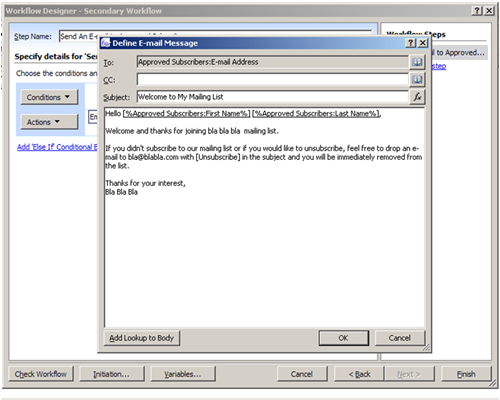 “List administrators should be able to send e-mails to all the approved and registered users specifying some filters. For instance, the list administrator should be capable of sending e-mails to all the registered users from Canada”. Starting with the next article, I will explain how to implement this requirement, which will involve the creation of primary and secondary workflows, integrate SharePoint lists with Microsoft Outlook and Microsoft Word 2007. As I told you in the beginning of this article, I had already started writing about SharePoint Designer Workflows before I received questions about the lookup fields and lists. When I was doing a research to avoid writing what has already been written, and to elaborate where others are vague or incomplete, I stumbled upon a great article by Paul Galvin titled “Email and SharePoint Designer Workflow” which provides a deep explanation to what I was about to cover. 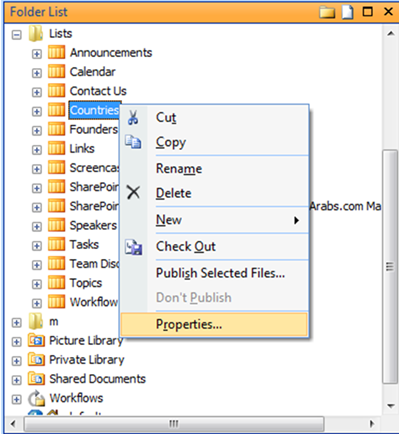 Therefore, if you are new to SharePoint Designer workflows, I would encourage you to have a look at this article. So you’ll be ready for my next post which will directly start creating and implementing the needed workflows without discussing what was smartly discussed by Paul as I am not a fan of reinventing the wheel.